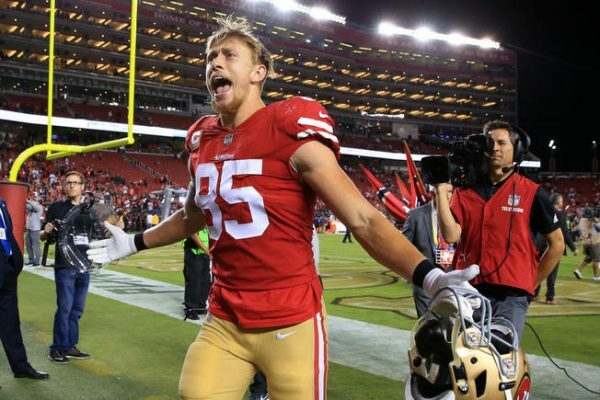 The 49’ers post season is in full swing, and on Tuesday the team was honored with a couple of awards for two of their players, who were named to the PFWA’s All-NFC team. Two 49ers were named Tuesday to the Pro Football Writers of America’s All-NFC Team. One was no surprise: Tight end George Kittle. The other was rookie kick returner Richie James, who accounted for the only kickoff return for a touchdown from any player in the NFC this season. James was a seventh-round draft pick in 2018 from Middle Tennessee. He also finished third in kick return yards among players in the NFC. He had 580 yards in returns. Marvin Hall (Atlanta) led the conference with 616 yards, while Corey Coleman (New York Giants) had 598 yards. James’ 25.2 average on 23 returns ranked behind Coleman’s 26.0 average and ahead of Hall’s 23.7 mark. But James was one of just five players in the NFL to have a kick return for a touchdown this season, and he was the only kick returner in the NFC to get into the end zone. His 97-yard return was a key play in the 49ers’ 26-23 upset of the Seattle Seahawks in Week 15. Be the first to comment on "Two 49ers Named to the PFWA’s All-NFC Team"